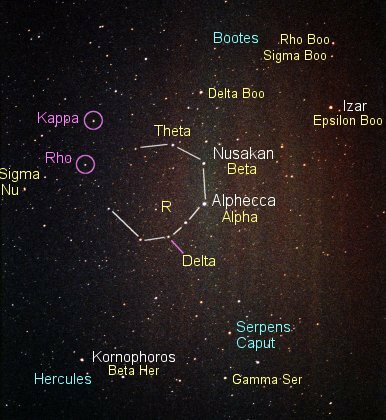 The circle shows the location of the solar type class G star Rho Coronae Borealis (in the constellation Corona Borealis). The planet orbits Rho Coronae Borealis in 39.6 days (45 percent that of Mercury's orbital period around the Sun) and is and is 0.23 astronomical units from the star (which equals 35 million kilometers, 21 million miles, or 59 percent Mercury's distance from the Sun). The discovery measurements give a lower limit to the planet's mass of 1.1 times the mass of Jupiter. However, the star is surrounded by an extended dusty disk (detected out to about 85 astronomical units) that may represent the debris of the formation of the planetary system (akin to the "Kuiper Belt" of comets that stretches beyond the orbit of Pluto). From the measured tilt of the disk, Rho Coronae Borealis's planet is found to have a mass 1.5 times that of Jupiter. Rho Coronae Borealis is a fifth magnitude (on the faint side, 5.41) class G (G2, some suggest G0) ordinary dwarf 57 light years away. Though about the same temperature as the Sun (perhaps a bit warmer), and about the same mass, it is 1.75 times more luminous, probably as a result of greater age (estimated to be 10 billion years, twice the solar age). The star is the closest match to the Sun of any with known orbiting planets. Kappa Coronae Borealis, the upper star in the picture, also has an orbiting planet.